nicu's FOSS'n'stuff: Some Azure ads, please? My name is [redacted] and I represent the digital media agency having Microsoft as a client. 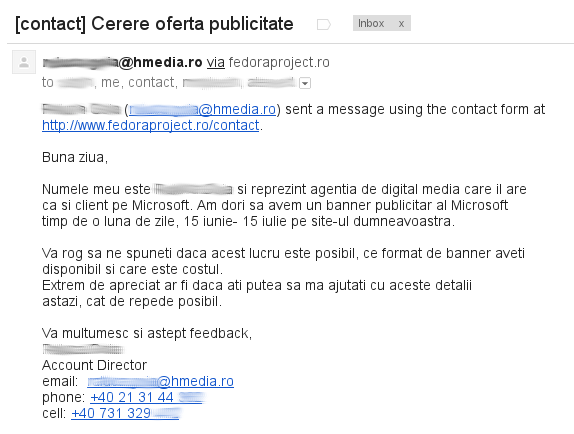 We wish to have a banner ad for Microsoft on your site, running for a month, 15 June - 15 July. Please tell if this is possible, which banner format do you have available and what is the cost. It would be appreciated if you can help with those details today, as soon as possible. Thank you and waiting for your feedback"
When I stopped laughing, I decided to investigate further and learn if is a naive person, lacking basic clues about technology, FOSS and even her client or a sneaky maneuver from Microsoft trying to corrupt communities. I replied, expressing my genuine curiosity to learn why the website of a Free Software community and Linux distro would be a good place for Microsoft advertising and the answer was "we are promoting a new product, Microsoft Azure, which is intended for programmers and your website is in our target audience" (again, translation mine). I had to lecture again about how Fedora is in both ideological and technical competition with Microsoft and how we can promote only products released under a Free license (preferably GPL) and also free from patents. Now my curiosity is, starting 15 June, how many FOSS communities (if any), in the country and outside it, will run an Azure banner ad. Update: it looks like our Ubuntu friends have their share of fun too. vor fi publicate sub licenta libera, de preferat GPL si nu vor avea utilizarea restrictionata de patente." i don't know about Ubuntu, but by definition "The Fedora Project is the name of a worldwide community of people who love, use, and build free software"